Who's ready for the fair?! The 77th annual Marin County Fair opens on Saturday, June 30, at the Marin County Fairgrounds in San Rafael, near the Marin Civic Center. This year's Marin County Fair theme is "All for One, Fun for All!" The 2018 Marin County Fair celebrates fun and features plenty of special competetions, including Pool Noodle Art, Fun with Frisbees, Decorate a Flag, School Spirit, and more. Of course you'll also find the usual thrilling rides, popular concerts, farm animals, family activities, amazing exhibits, and a spectacular nightly fireworks display. Events and attractions include traditional fair offerings like farm animal exhibits and demonstrations and Great American pig racing in the barnyard, 28 free (with fair admission) carnival rides—including the 10-story Giant Wheel and the Marin Clean Energy solar-powered carousel. You'll also experience appearances by the ever-popular Imperial Storm Troopers of the 501st Legion Golden Gate Garrison, Balloonacy, Something Ridiculous comedy juggling duo; fantastic concerts, short films and videos, demonstrations on the Blue Ribbon Stage, music and dance contests on the Three Twins Solar Stage; over 12,000 exhibits; and the Fair's biggest and most elaborate fireworks display ever, presented nightly over the lagoon at 9:30 pm. This year's Marin County Fair runs from Saturday, June 30 through Wednesday, July 4, from 11 am to 11 pm daily. The exhibit hall and auditorium close at 9:30 pm; the carnival stays open until 11 pm. Admission to the Marin County Fair is $15 in advance or $20 at the gate for adults 13–64 and $12 or $15 for seniors 65 and over and children 4–12. Admission is free for children 3 and under. Order advance tickets online here. All admission prices include exhibits, entertainment, nightly fireworks, and carnival rides. A special $3 ticket is required for the Wacky Worm Coaster, the Drop Shot Tower, and the Freak Out. The Fair accepts Visa and Mastercard at the gate for admission, and there is an ATM inside the main gate. Monday, July 2 is Children's Day: children 12 and under are admitted free. You'll also get to see plenty of local talent perform throughout the day on the Three Twins Solar Stage. The Marin County Fairgrounds are located near the Marin Civic Center in northern San Rafael, right off Highway 101. Parking for cars and motorcycles is $15–$20 in all lots. You can also park your car at nearby Marin Commons (1600 Los Gamos Drive) and take the free Marin County Fair Shuttle to the fairgrounds; parking here is free; shuttle rides cost $2 per person. The Marin County Fair is also serviced by several different Golden Gate Transit and Marin Transit bus lines as well as the SMART train; for more information, visit www.goldengate.org, www.marintransit.org, and sonomamarintrain.org or call 511. You can also ride your bike to the fair—the Marin County Bicycle Coalition will offer free valet bicycle parking at the main gate from 11 am to 7 pm daily. To get to the Marin Country Fairgrounds, take Highway 101 to the North San Pedro Road exit and head east on North San Pedro Road toward the Marin Civic Center. Turn left at the stop light onto Civic Center Drive and look for parking—you'll find it near the Lagoon Park and around the Marin Veterans' Memorial Auditorium. Additional paid parking can be found in lots off civic center drive just north of the fairgrounds. Ice chests, coolers, pets, cans, or glass bottles are not permitted, and the Marin County Fair is a smoke-free event. 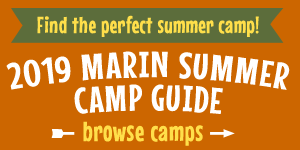 For more information on this year's Marin County Fair, visit www.marinfair.org or call (415) 499-6800.